Plastic tube forming. This plastic tubing coil forming machine, will make a formed coiled plastic tube by solvent bonding the tube to itself. A plastic tube coil is then formed with the tubing attached to itself. A coil of plastic tubing will be formed with a permanent coil to the plastic medical tubing. A formed coil can be achieved by solvent bonding the plastic tubing into a formed coil. Another approach would be to heat set a permanent shape into the plastic medical tubing to form the coiled shape. Close up of coiling station on the plastic medical tubing coil former,. 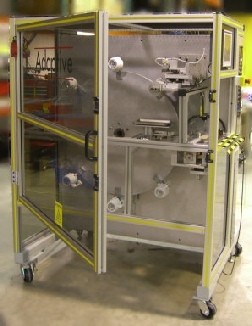 There are multiple coiling stations on the machine to allow the solvent time to bond the plastic tubing to itself. • The operator will manually load the precut medical plastic tubing, maintaining its orientation into an opening, for each machine cycle. • Machine clamps plastic tubing, continuously applies THF solvent to the plastic medical tubing. • Coiling of the plastic tubing process begins. • When correct number of coiled turns of plastic tubing is made, machine indexes to next winding station. • When coiled plastic tubing coil reaches eject station, the coiled tubing is ejected to chute, for further processing or packaging.